Back when I wrote a review of Finch, I called Jeff Vandermeer the “Hierophant of the New Weird”. I used that unusual word on purpose, then, and I use it here now. New Weird, as written by China Mieville, Jeff Vandermeer and others is one of the odder corners of genre. And yet for its strangeness, The New Weird is a slippery thing, something that often lacks a good definition beyond “I know it when I see it.” Its fantastika at one of its most creative and bizarre aspects. Whatever the New Weird really is, Jeff Vandermeer is its guiding light. And with The Thackery T. Lambshead Cabinet of Curiosities, he has once again invited a talented team of writers, artists and creative types to return to an imaginary world that is a slightly distorted mirror of our own. In 2003, Jeff Vandermeer teamed up with Mark Roberts to produce The Thackery T. Lambshead Pocket Guide to Eccentric & Discredited Diseases, which was an imaginary guide to bizarre and mysterious diseases and afflictions, the conceit being that the eponymous doctor had first collected the list of diseases decades ago and this was the latest edition of that scholarly, seminal tome. An extremely talented group of writers came together under Vandermeer and Roberts’ guidance to produce vignettes about these imaginary afflictions. Postmodern, self-referential and definitely more than a little bit of slipstream with a side order of genre weirdness, the book was a keystone in the New Weird “movement”. 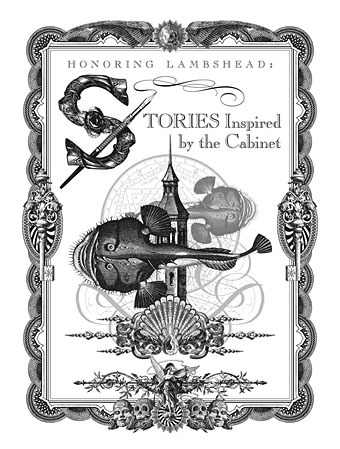 Now, some years later, Jeff Vandermeer, lately a major figure in the development of Steampunk, has teamed up with his wife Ann Vandermeer (also an essential partner with Jeff’s efforts in Steampunk) to produce a second volume of New Weird, this entitled The Thackery T. Lambshead Cabinet of Curiosities. The conceit this time is that, in the wake of the death of Dr. Lambshead, and a fire in his house, his prodigious collection of unusual objects, the “Cabinet of curiosities”, is being revealed to light. With another stable of fine writers, ranging from China Mieville to Mur Lafferty to Cherie Priest to Michael Moorcock, the Vandermeers have pulled out the stops to try and capture the magic of the New Weird. The book is divided into several sections, based on the kind of content the authors provide. There are some metatextual bits in the introductions that show the humor of the collection, fitting the authors themselves into the world of Dr. Lambshead. These sections also continue that metatextual self-referential playfulness that you can find in Vandermeer’s work, with sections entitled such as “The Mieville Anomalies”. It’s not just the writing that makes this volume special. Yes, the stories, vignettes, studies of objects and the metatextual bits are, uniformly, of high quality and caliber, even if they wildly vary in tone and content, and provide incomplete pieces to the puzzle of the fictional Lambshead’s life and work. The Vandermeers also have obtained a crop of artists to provide photoshopped photography, drawings, and illustrations that illuminate the text. I didn’t recognize the names of most of the artists but one did jump out at me—Mike Mignola, creator of Hellboy and The Amazing Screw-on head. He even has one of the sections of the book named after him. But as you can see, the quality of the artwork and drawings are just as amazing as the text. Like the movie Citizen Kane, reading the entire book gives a viewpoint to Dr. Lambshead, the man and his work. And yes, one of the entries solves the mystery of how the fire occurred and why but, like Rosebud, I will not reveal that secret. Each individual entry and catalogue entry is interesting and unique, however, a facet of the world that readers can visit again and again. Gamemasters, too, who run modern roleplaying games that focus on the surreal (such as The Dresden Files, Over the Edge, or The Esoterrorists) will be inspired by this book for ideas on how to drop unusual and unique fantastika items into their adventures. The book is dedicated to the late Kage Baker, who, like some of the contributors in this book, was featured in the first volume. I could only wish to know what she might have contributed to add to an impressive and entertaining work such as this. I was born and raised in Staten Island, the forgotten borough of New York City. After a stint in California better glossed over, I've lived and worked for the last 8 years in the Great White North that is Minnesota. In the real world, I work at a mundane job having nothing to do with speculative fiction except when I ply my colleagues with SF references... On the other side of the veil, I've been reading SF and Fantasy for over 30 years. I started with Asimov, Bradbury, Vance, Tolkien and Fantasy, and have been hooked ever since. Over the last few years, I've been writing reviews of the books I read. My other genre love is roleplaying games, and I've been playing those for 25 years. I have been running the same play by email game for over 15 years (Strange Bedfellows), based on the Amber world of Roger Zelazny. I also play with local gamers, and go to the occasional gaming convention. Oh, and one day, I will actually write my trunk novel. Nice review, Paul. It’s a very engrossing, fabulous work and I agree that there’s a lot of pleasure and inspiration here.